Creative Uses for Waste Paper: Three crafty ways to use paper that you’d otherwise throw out. Got waste paper? Don’t we all! From junk mail to printer glitches to old love letters… we throw out tons of used paper every day. Nearly two pounds of paper and cardboard per person are thrown out every day in industrialized countries. There’s a better way than to dump it all in the trash and take it to the curb for pick up. Here’s how to use it creatively for beauty, for utility and for fun. 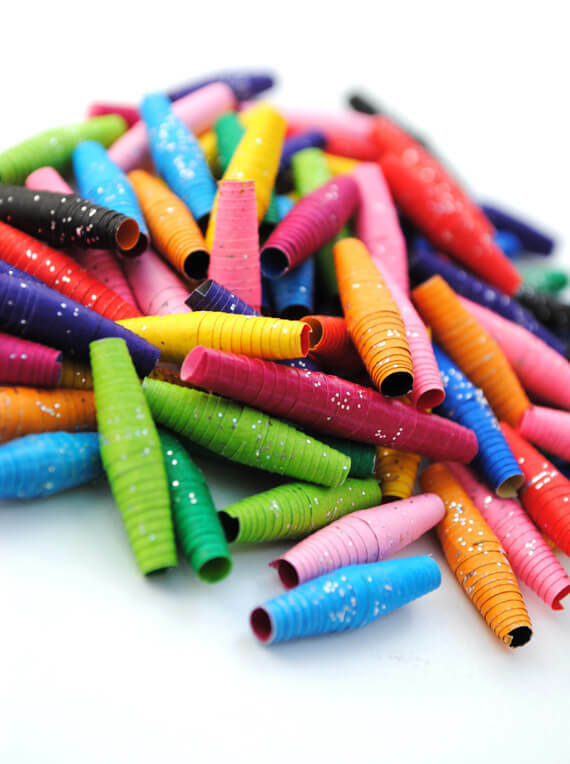 Paper beads are simple to make and produce an amazingly beautiful product. You’ll need a toothpick or two, white glue and scissors – and some junk mail or an old catalog or magazine, the more colorful, the better. To start, cut a strip of paper, starting about a quarter of an inch long and tapering it gently to a point. Three inches should be long enough. Dip a toothpick in glue and coat the paper lightly with it, then roll it onto the toothpick; not too tightly, though. Make sure the end of the paper strip sticks to itself, then slide it gently from the toothpick. Leave it to dry while you make other beads. When you’ve made several and they’re dry, coat them with white glue or shellac, let them dry, and string or decorate with them like you would other beads. Paper cutting is a craft that probably originated in China, where it’s a fine art, producing delicately detailed artwork. We don’t have to go to that extreme to have fun with paper cutting. A colorful page from a magazine works really well for this. First you’ll need to square it, the fold it over in the center. Fold again the other way and then the other direction until you’ve folded it at least four times. The more even you keep the folds, the better will be the design. Practice with a traditional design by first snipping off all four corners, then in the center of each fold, cut out a triangle. If you have room, cut two smaller triangle on each side of one larger one. Be careful to not cut completely across the paper or to cut a side completely out – you need that to hold your design together! When you’ve cut all the sides and corners, unfold your paper. Experiment by cutting different shapes on the fold edges. Curlicues, slanted bars, odd shaped squiggles – anything goes. You don’t have to make all sides the same, either. The pattern will balance itself. What to do with paper cut patterns? Glue them over sheets of construction paper for placemats for a child’s birthday party. Or make small versions to decorate hand made greeting cards. Got an ugly box? Or book? Or table top? 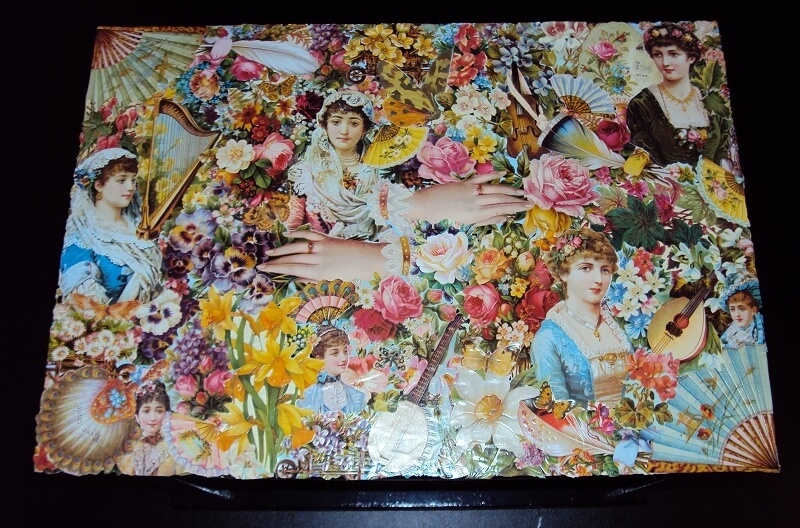 Decoupage it with junk mail! No, don’t cover everything with advertisements (unless that’s your style), but if you look carefully at the junk mail coming into your home, you’ll soon discover small pictures, colorful snippets, intriguing single letters or decorative designs on the envelopes or inner pages. To begin, coat the paper with white glue on both sides and let it dry. Then cut out what you like, throw away the rest and arrange the pieces until you’re satisfied with the way they look. Using white glue again, generously coat a cardboard box, a book cover, a table top, a trash basket, a pair of shoes… well, maybe not the shoes, but almost anything else that needs a little updating. Put a thinner coat of glue on your cut pieces and arrange them on your object of art. Make sure they’re smooth and exactly where you want them. After the whole thing has dried, you can coat it with glue or shellac to preserve it. With a little practice, you can make beautiful pictures and designs with nothing but trash paper, scissors and glue. Why waste your paper trash by throwing it out? Make something with it!